Reverberation. A sought after attribute in traditional worship spaces. It provides natural acoustic characteristics that are excellent for choirs and congregational singing. It also poses a challenge when designing a sound reinforcement system that will provide quality speech intelligibility and the capacity to reinforce some contemporary style music. 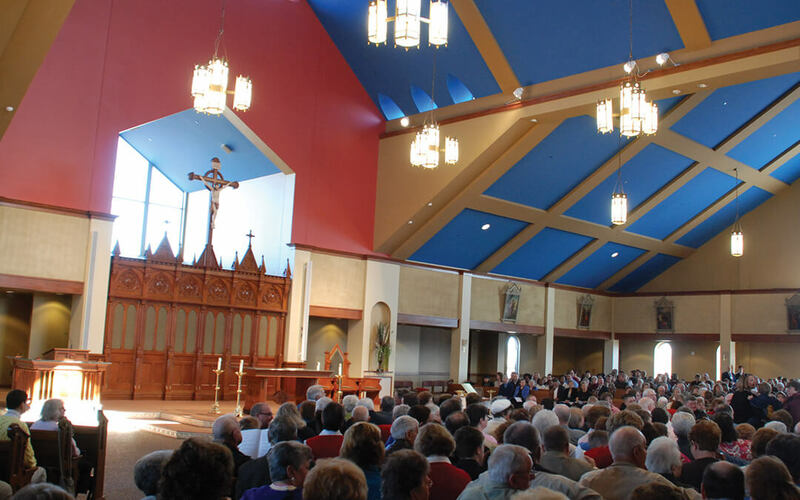 Diversified Design Group, Inc. was able to provide just that and more when designing the AV system for Jesus Christ Prince of Peace Catholic Church. Using three state-of-the-art steerable line arrays, custom subwoofers and the proper modeling and commissioning techniques, we were able to integrate intelligible sound reinforcement in a space designed with ample reverberation times. The AV system also included an automatic mixer for everyday use, a remote analog mixing console for special musical events and a dual projector video system capable of providing a quality image even with higher ambient light levels. Diversified Design Group, Inc. provided the congregation with a high quality AV system that allowed them to do some more contemporary services in a traditional worship space.